There’s going to be plenty of buzz surrounding the St. Louis Blues this season, with the recent re-signing of Jaden Schwartz, all of the new talent coming in droves, and the new jerseys/attitude of the team. However, the biggest hockey news outside of the Blues themselves is set to become a Scottrade area mainstay in the winter of 2015, and it may just be exactly what you’ve been waiting for. The Center Ice Brewing Company is a craft microbrewery that was started by an area hockey player who was looking for something a little bit different in his beer, something that would bring him back to his skating roots while providing an outlet and an atmosphere that only those true hockey enthusiasts would understand. That’s exactly what the brain trust at Center Ice Brewing is bringing to the table with its drafts, and the atmosphere it’s going for at the establishment should bring everything together full face-off circle. 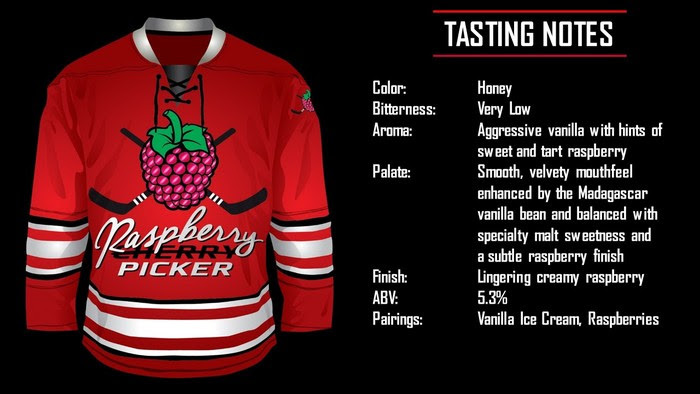 The folks at Center Ice Brewing are looking to build out a new type of bar, a truly hockey oriented foundation, where everything is catered to the numerous hockey players and fans around the St. Louis area. The idea was simple, create an atmosphere that would drive any St. Louis area sports nut (and hockey fanatic) crazy with call backs to the old Arena days and to the Blues greats, and fresh draft beers that dance on your taste buds, suit any mood you may be in, and leave you chanting LET’S GO BLUES as you go on your way. Steve Albers (head of Center Ice Brewing) wanted a place to rejoice with fellow hockey fans, and to truly follow his passion for the sport and for the drink that completes it (for so many). His plans currently involve 4 signature beers that aren’t your average products, which should bring a breath of fresh air into the city that started the beer revolution so many decades ago. 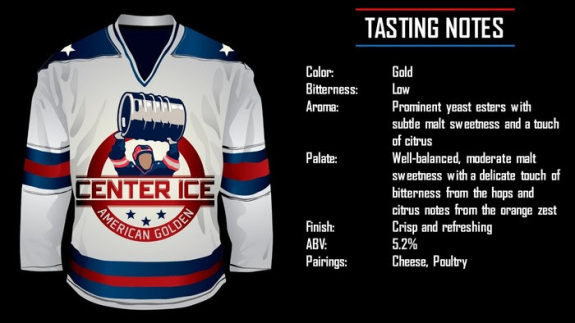 Center Ice American Golden Ale is the flagship beer for the Center Ice Brewing Company. First, our Center Ice American Golden Ale pours a bright golden hue with a white frothy head. Zested with fresh oranges, citrus notes help balance the subtle malt sweetness. 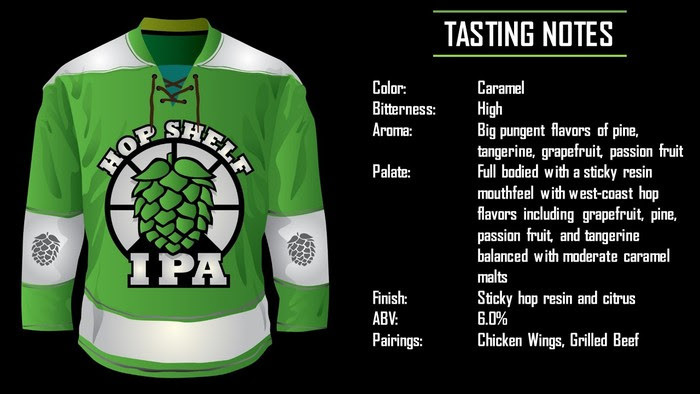 Designed to unite hockey fans and craft beer enthusiasts, its crisp refreshing finish leaves the palate wanting more. Hop Shelf IPA is sure to send your taste buds flying as if they were blindsided by Ryan Reaves himself. Second, our Hop Shelf IPA was brewed and dry-hopped with an abundant amount of hops. Four different hop varietals give big bold flavors and aromas of grapefruit, passion fruit, pine and tangerine. A plentiful amount of honey malt balances our version of this American IPA. 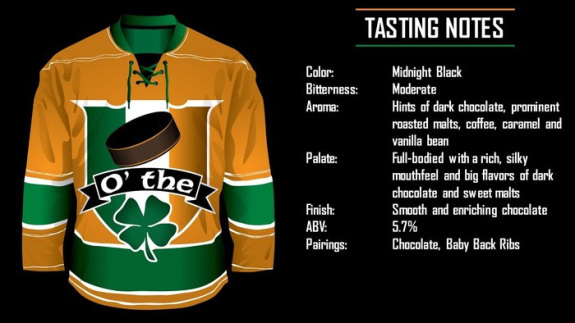 This dark frothy beverage is sure to be a mainstay for hockey enthusiasts as it will make you feel like your jersey is a part of you. Third, our Puck o’ the Irish Stout is our full-bodied chocolate Irish Stout. It pours as black as a hockey puck with aromas of dark chocolate and sweet caramel. Brewed with malted barley imported from Cork, Ireland and aged with fresh cacao nibs, this is a desirably rich stout for all chocolate fans. This light wheat toned beer will keep the ladies happy as if they were watching TJ Oshie go in on a breakaway from a stretch pass. 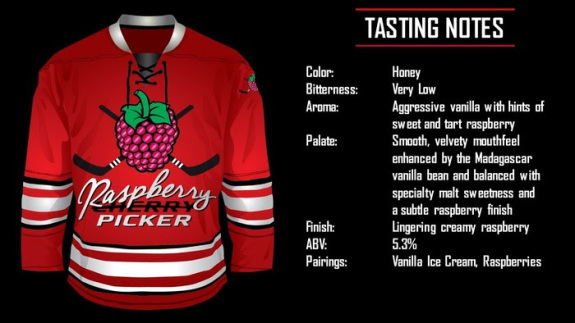 Lastly, our Raspberry Picker originates from the hockey term, Cherry Picker. Raspberry Picker is brewed with fresh raspberries, whole vanilla beans and lactose. Hints of subtle raspberry with a smooth, velvety mouth feel make this beautifully balanced beer a perfect complement to most desserts. Though those descriptions make you salivate with anticipation, they may not even be the best part. Center Ice Brewing is dedicated to keeping their favorite team, the St. Louis Blues close to their heart by trying to create a tasting room out of scraps from the old Arena, to go along with their hockey stick and puck tap handles (some of which are signed by current and former Blues players) and their hockey jersey bottles. 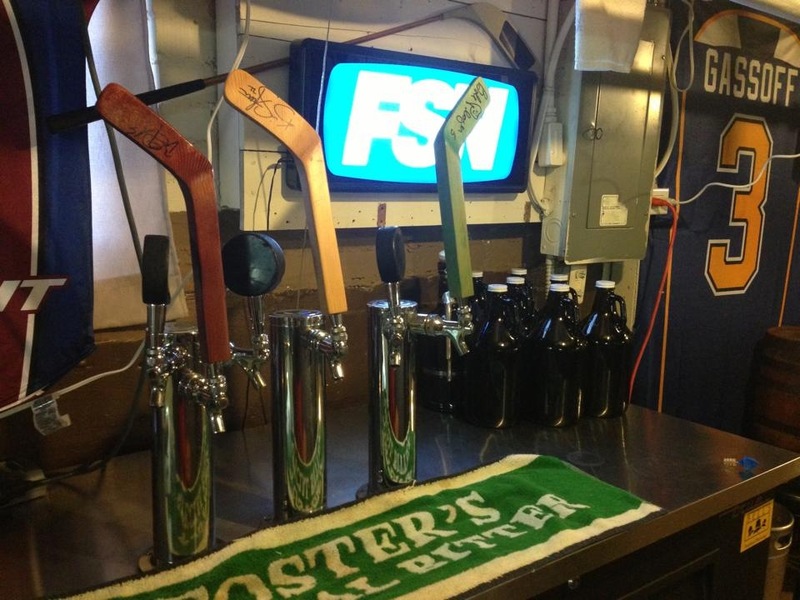 Some of the signed stick-taps to be used at the Center Ice Brewery. The promised ambiance at Center Ice Brewing is breathtaking to any Blues fan, or any fan of hockey for that matter, but the group needs your help to make their dream a full reality! They are currently ending their first Kickstarter campaign (which you can donate by clicking this link: ), with the goal of gaining the initial $25,000 investment needed to begin finding that perfect location near Scottrade to build out. Please donate what you can to turn every St. Louis area hockey fan’s dreams into realities so we can begin celebrating the Blues and the greatest sport on Earth together next December (2015). If you’d like more information about Center Ice Brewing or about what they are trying to accomplish in the St. Louis area, follow them on Twitter: @CenterIceBrew. Also give me a follow while you’re at it: @pep30.